How do you make an iMac desktop that doubles as a multitouch tablet? If you're Apple: just like this. Why can't the future be now already? The patent above, unearthed by Patently Apple, shows off Apple's plans to bring together its desktop and tablet lines. Which explains how Mac OS X and iOS might actually live in harmony someday. For example, an accelerometer in the display could sense the force of gravity along an axis, and the measured force could be used to determine an angle of the display with respect to the ground (i.e. the plane perpendicular to the direction of the force of gravity). A transition between input modes could be performed when the vertical angle (tilt) of the display crosses a predetermined angle. 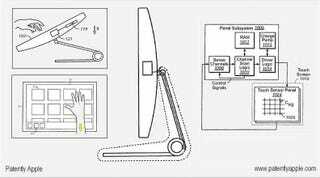 Or a touch sensor could be implemented to determine how the display is being grasped. The patent covers both desktop and notebook devices.